Grandmaster Parimarjan Negi won the Delhi State Blitz Chess Championship convincingly with 6.5 points at Amity International School, Saket. 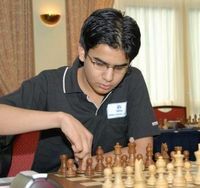 Karun Duggal, who held Negi in the fifth round finished second with 5.5 points while Sandeep Chitkara and Hemant Sharma finished third and fourth respectively. Meanwhile in the Open Rapid category, Karun Duggal took the pole position with 5.5 points while Akram Baig and Ajit Kumar Verma tied for the second spot with 5 points but better tie break score help Akram to take the second place honours while Verma satisfied with third spot.